STEC is an acronym for Shiga toxin-producing Escherichia coli. Most E. coli bacteria are normal inhabitants of the intestinal tracts of humans and animals, and are non-pathogenic (do not cause disease). However, some E. coli are pathogenic (i.e., disease-producing). 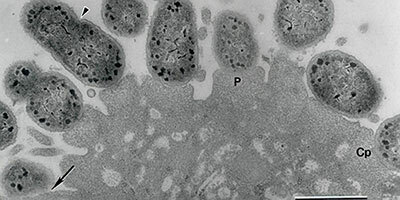 STEC is a type of pathogenic E. coli that, as the name implies, produces a potent toxin called Shiga toxin (Stx), also known as verotoxin or verocytotoxin. Stx causes blood vessel damage and plays a key role in other events that result in hemorrhagic colitis (bloody diarrhea), and a type of kidney failure called hemolytic uremic syndrome (HUS) in human patients. STEC, including E. coli O157:H7, is the number one cause of acute kidney failure in children. Human outbreaks of STEC-related disease occur through consumption of contaminated food or water, through direct contact with infected animals or environments contaminated by their feces, or by direct human-to-human contact with infected persons (i.e. secondary infections). Cattle and other ruminant animals such as deer are natural reservoirs of STEC, which can lead to contamination of meat and milk during harvest and processing. Other foods such as fresh produce can become contaminated with STEC from these animals due to water contamination, run-off from animal production units, or dust and insects from animal production facilities. Due to a low infectious dose and severity of disease manifestations for most STEC, their presence in raw and processed foods poses an important human health risk. Centers for Disease Control and Prevention (CDC). National Shiga toxin-producing Escherichia coli (STEC) Surveillance Overview. Atlanta, Georgia: US Department of Health and Human Services, CDC, 2012.